Spring is a busy time for native plant enthusiasts. In addition to garden activities, there are the garden tours, plant sales, Earth Day activities – the list goes on and on! Many of the events call for California Gourmet treats – appetizers or desserts that feature California native plant flavors. Needed are crowd pleasing tidbits that are easy to make and serve; and here’s where native fruit syrups are real a time-saver. 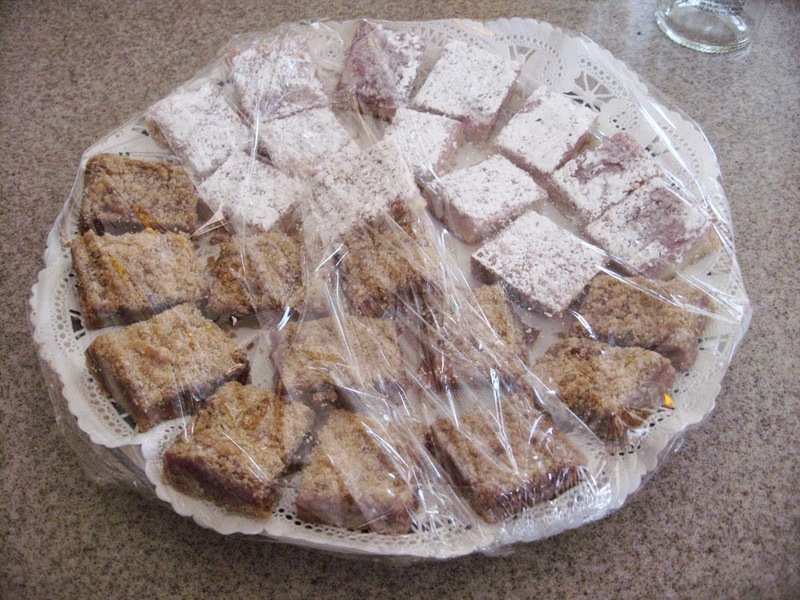 Flavored syrups can be used to create a number of treats – including bar cookies. For more on making flavored syrups see: http://mother-natures-backyard.blogspot.com/2015/01/california-gourmet-flavored-syrups.html. It’s hard to beat bar cookies for simple. They are often made from a limited number of common ingredients. 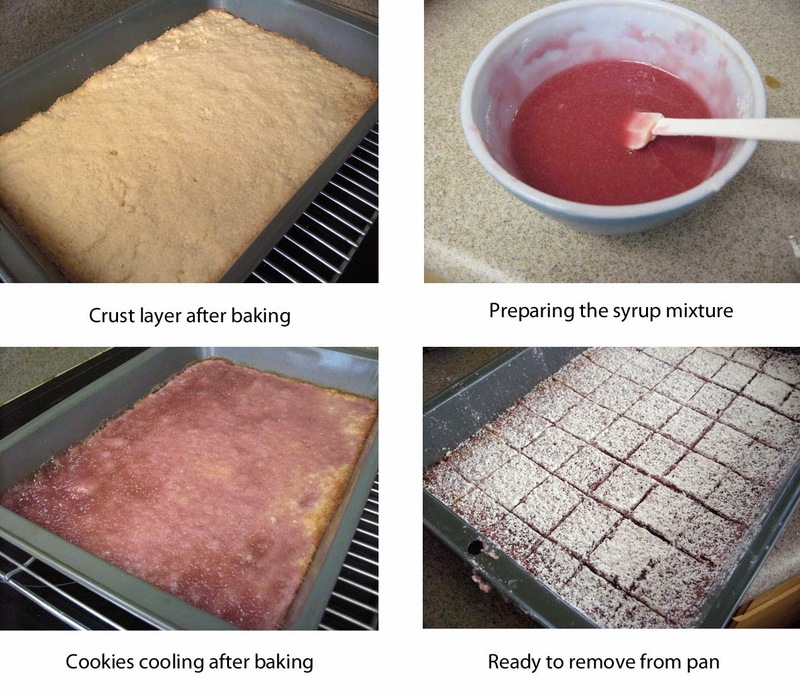 The ingredients are assembled and baked in a baking pan. The cooled cookies are cut into bars (whatever size is needed) and they’re ready to go. Because they are flat and rectangular, bar cookies also pack and travel well. Bar cookies are perfect for spring garden events and family desserts. We’ve modified several classic bar cookie recipes to feature fruit syrups as their key ingredient. 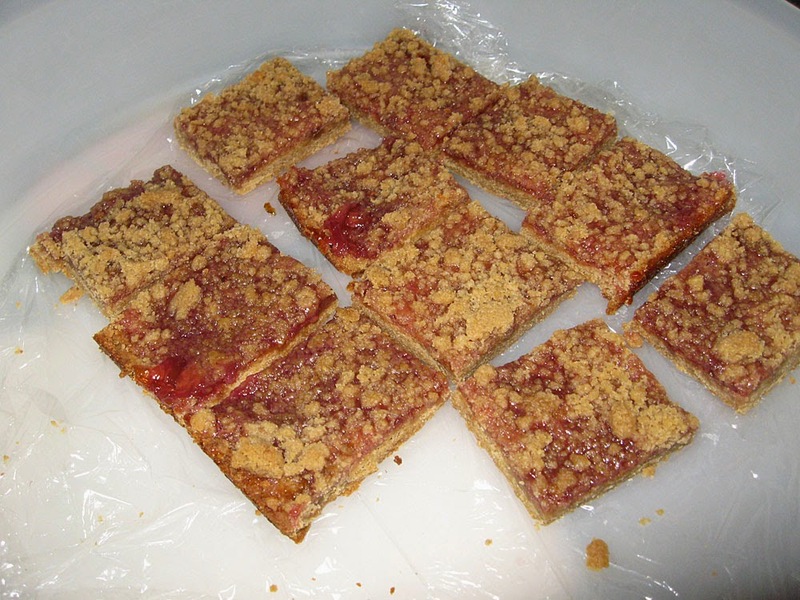 The Brown Sugar Berry Dream Bars are made with brown sugar and have a hint of caramel flavor. Syrups with a more robust flavor – elderberry, blackberry, blueberry, grape, etc. – combine well with the other flavors. The cookies are golden brown and contrast nicely with sugar cookies or the White Berry Dream Bars. These are delicious cookies – everyone who’s tried them loves them! The White Berry Dream Bars are lighter in color and flavor. They are reminiscent of tea parties and garden socials. These cookies are a wonderful way to feature the more delicately flavored syrups: wild hawthorn; rose hip; current/gooseberry; wild mint or other leaf flavors; elderflower; etc. 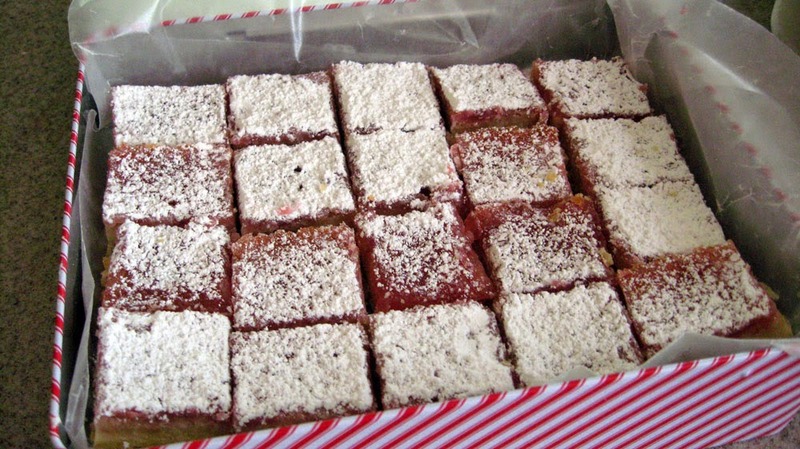 We like to dust our White Berry Dream Bars with powdered sugar to make them even more festive. Once again, these are not just pretty – they are truly scrumptious cookies. Cream butter/margarine and brown sugar until well blended. Using a pastry blender or two forks, blend in the flour until mixture is homogeneous and crumbly. Spread 2/3 of the crust mixture into a greased 9 x 13 inch baking pan. Press down firmly to make an even crust. Bake at 375° F for 10 minutes or until lightly browned. Remove from oven and let cool slightly. Cream butter/margarine and sugar until well blended. Using a pastry blender or two forks, blend in the 2 cups of flour until mixture is homogeneous and crumbly. 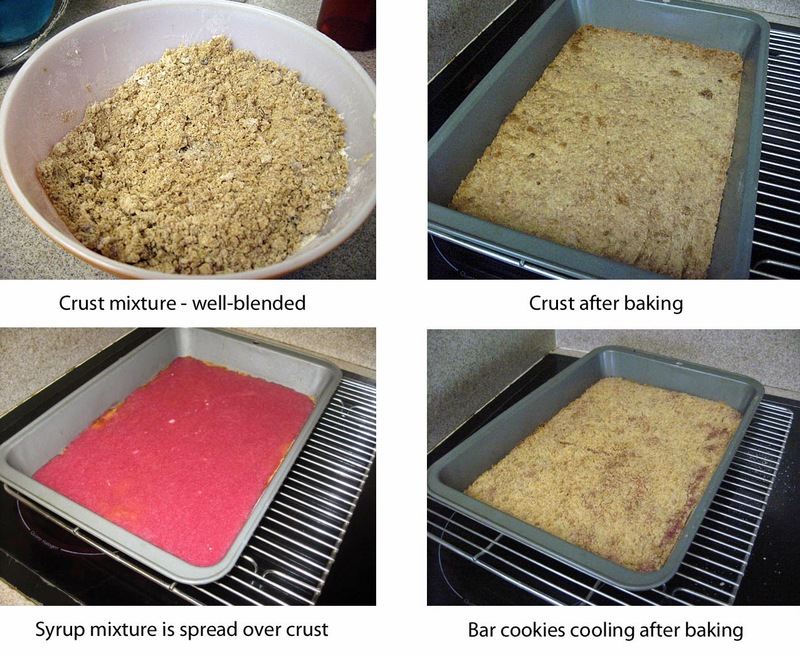 Spread crust mixture into a greased 9 x 13 inch baking pan. Press down firmly to make an even crust. Bake crust at 350° F for 15-20 minutes (or until lightly browned). Remove from oven and let cool slightly. Spring has definitely arrived in local gardens. Precipitation has been below average and the rains erratic; but some annual wildflowers are more than happy with the intense bouts of rain and subsequent heat. Among them is a sweet little annual known as Dotseed plantain. It’s blooming profusely in gardens throughout the South Bay, including Mother Nature’s Backyard. Dotseed plantain, also known as California plantain, Foothill plantain, Dwarf plantain and Annual plantain, is native to the California Floristic Province (the area of California west of the Sierra Nevada mountain range) into Oregon and south into Baja California, Mexico. It was once very common in lower elevation parts of Los Angeles County from the coastal bluffs and prairies to the desert. It can sometimes still be found on grassy beaches, coastal dunes, in vernal pools and other places that are wet in winter and dry out in spring. It also occurs on grassy, open slopes in coastal sage scrub, valley grassland and chaparral plant communities. 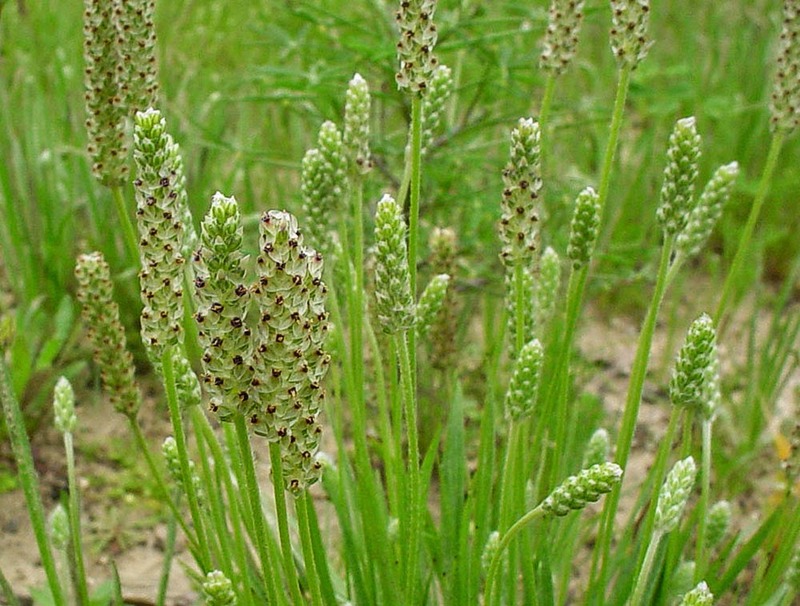 Dotseed plantain is a member of the genus Plantago (the Plantains), a genus with about 200 species world-wide. 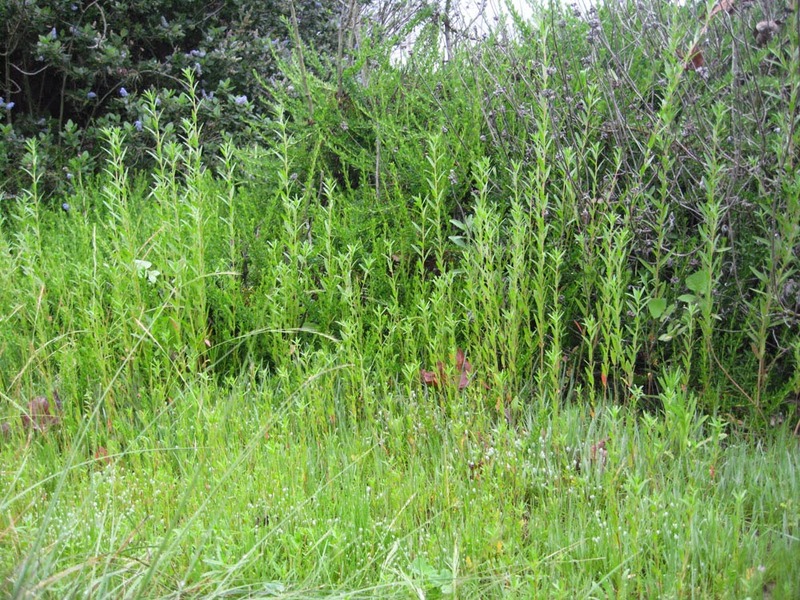 Most are small herbaceous plants of moist places; some (like the Common plantain, Plantago major and English plantain, Plantago lanceolata) are common roadside weeds. But many are used as larval food for certain species of butterfly (more on that below) and as medicinal plants. Southern California is home to four other native plantains: the Coastal plantain (Plantago elongata) which occurs in Orange and San Diego counties; the Desert (Wooly) plantain (Plantago ovata) which once grew near the Los Angeles county coast as well as in the desert; Patagonia plantain (Plantago patagonica) primarily in the San Bernardino and desert mountains; and the Mexican plantain (Plantago subnuda) mostly from the Orange county and Northern California coasts. 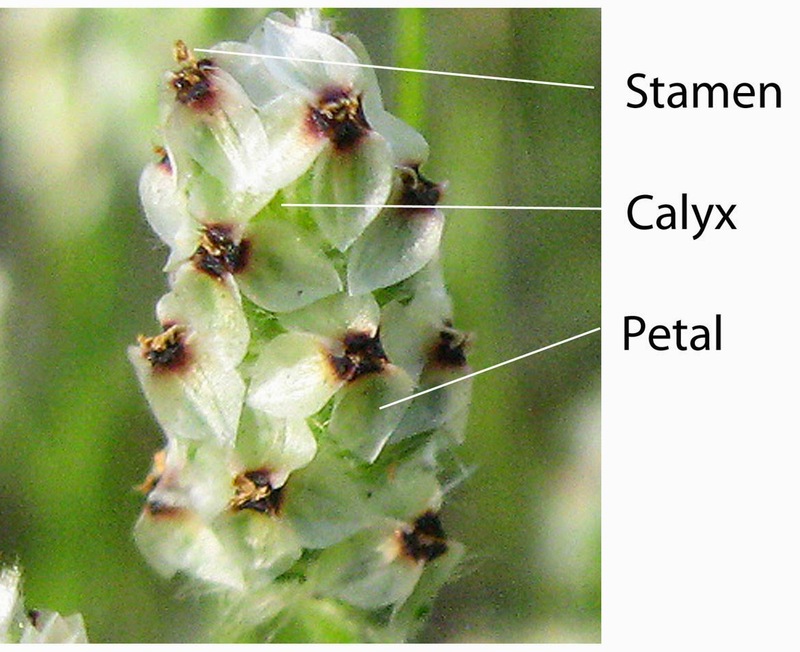 According to the USDA PLANTS database, the following are synonyms for Plantago erecta: Plantago erecta Morris ssp. rigidior Pilg. ; Plantago hookeriana Fisch. & C.A. Mey. var. 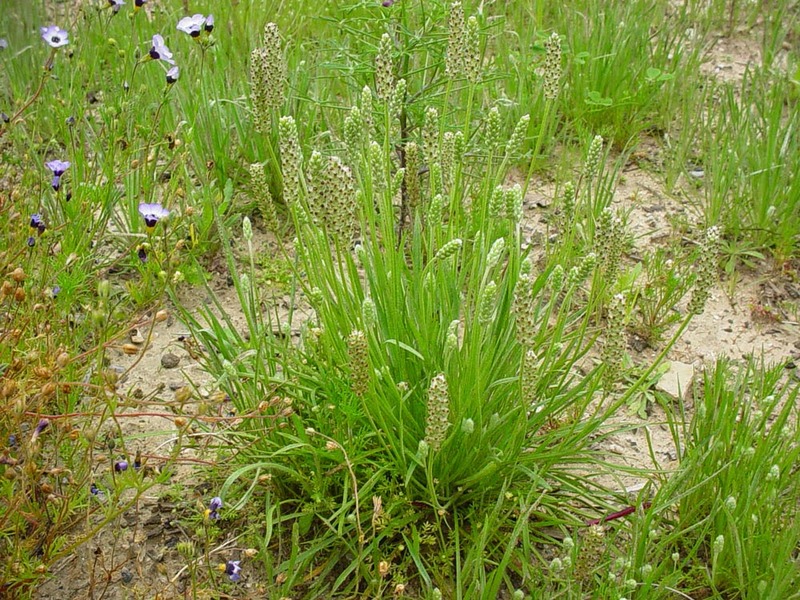 californica (Greene) Poe; and Plantago patagonica Jacq. var. californica Greene. Dotseed plantain is a small herbaceous annual, less than 12 inches (30 cm) tall and slender. It has narrow, sometimes needle-like, leaves growing from a basal rosette. The height of individual plants depends on light and soil conditions, at least one of which is soil moisture. In fact you sometimes see marked variation in height within a patch, with shorter (sometimes only 2-3 inch) plants along the drier margins. The entire plant is pale green and sparsely hairy with long, silky hairs visible with the naked eye. 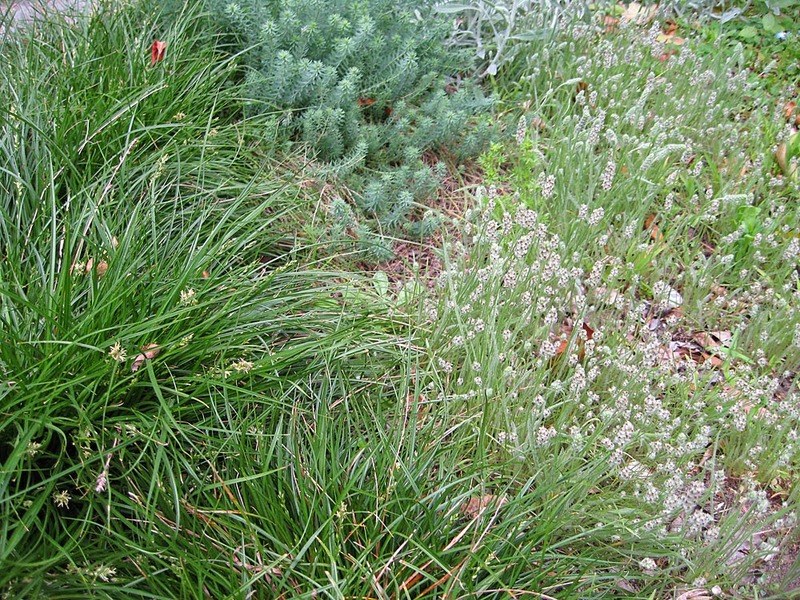 When growing densely, the plants look like a patch of small soft grass (see below). Like other annual wildflowers, Plantago erecta germinates with the winter rains. In our experience, seeds don’t germinate until the ground is well-saturated, often in January. Don’t count on lots of plants every year. Like other wildflowers, some years are better suited than others. 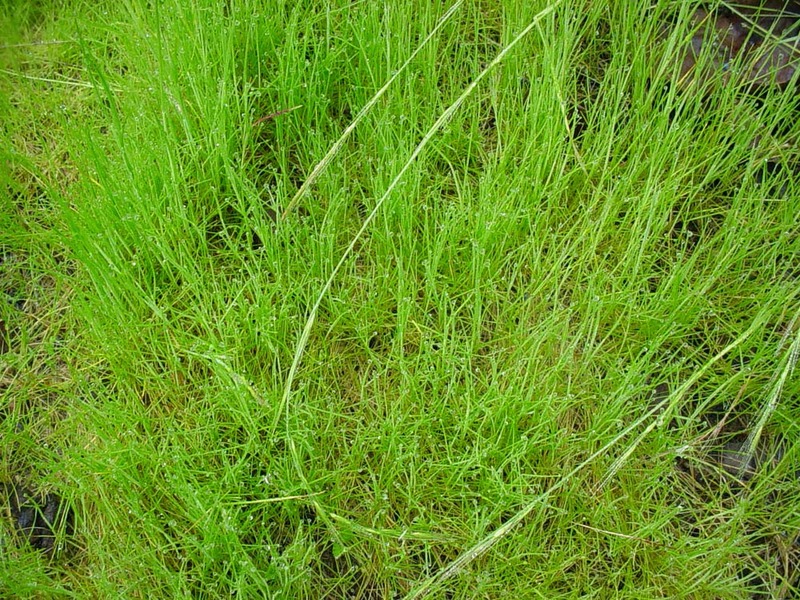 New seedlings look like small, soft grass seedlings – in fact they may be difficult to tell apart. 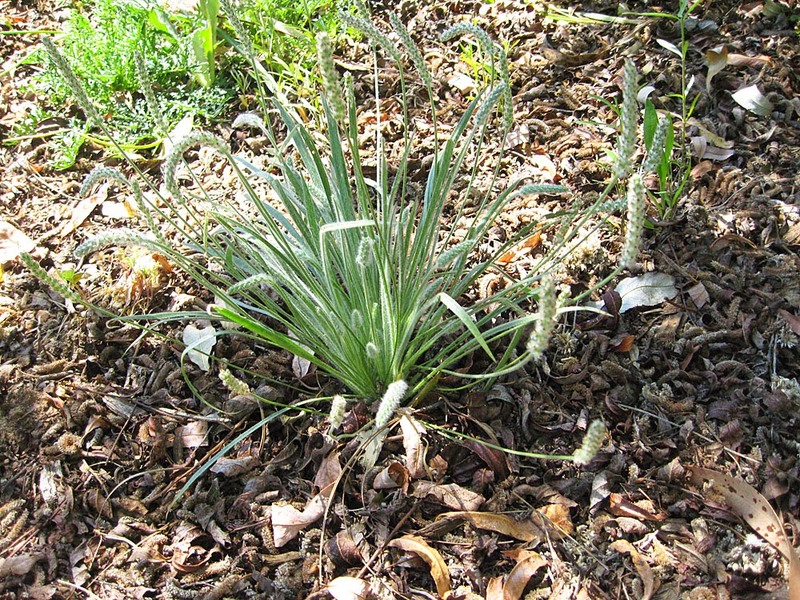 If you grow Dotseed plantain, refrain from pulling those ‘grass seedlings’ in winter until you’re certain they aren’t young Plantago. Dotseed plantain has interesting flowers, but you’ll have to look closely. The flowers themselves are very small – less than 5 mm (1/4 inch) across – and not particularly colorful. The flowers are closely spaced along flowering stalks slightly longer than the leaves; these stalks give the plants their characteristic appearance this time of year. There may be as few as 5-6 to as many as 50+ flowers on each stem (see below). The flowering portion covers less than 1/5 of the flowering stalk in this species. The flowers are mostly bisexual and in parts of four (see below). Petals are rounded with pointed tips and are almost transparent except at their base. The petals are spread back (reflexed) from the sexual organs. The stamens (male sexual organs) are difficult to see without magnification; they are relatively short compared to some plantain species. The plantains with showy, extended stamens are wind pollinated (similar to grasses); Dotseed plantain is pollinated by small insects. Dotseed plantain is an annual, and an early one at that. It usually blooms in March in our area. The flowering season lasts only a few weeks in most years, and the plants themselves die back – or are masked by the later-blooming annuals – by mid-April. The dried flower stalks remain on the plant until the seeds mature and are released – often not until early summer. The dried stalks are pretty in their own right, but are often hidden by other plants. The small dry seed capsules open from the top, releasing several seeds. Like many native wildflowers, Dotseed plantain is easy to grow. It likes full sun but may appreciate afternoon shade in inland gardens. It’s not particular about soil type. All it really needs is moist soil from January through March. After flowering ceases, plants should be allowed to dry out, completing the seed development process. 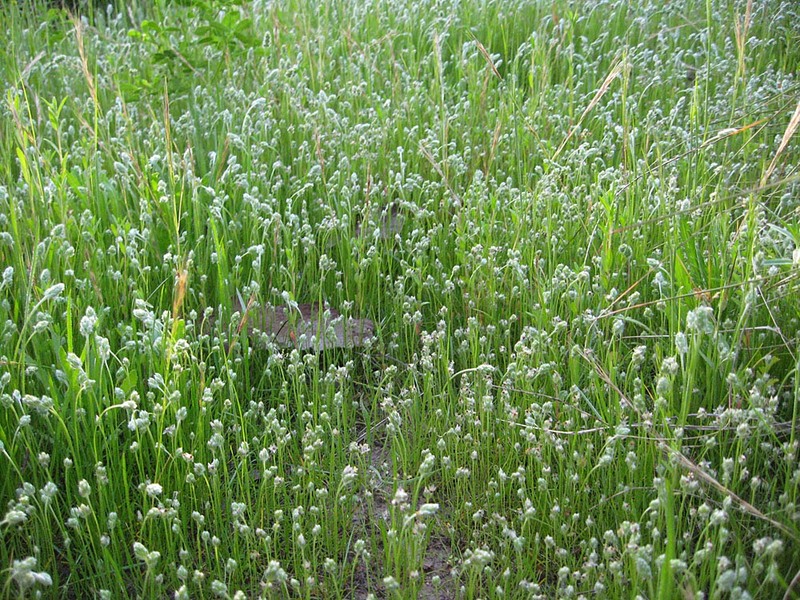 Once Plantago erecta is established it will re-seed on bare ground (or thin mulch) and will even expand its original range if happy. Dotseed plantain is a perfect annual to fill in around shrubs. It does brilliantly along walkways and mixes well with native grasses and other annual wildflowers, California poppies and perennials. It gives an early touch of green in winter – a first hint of spring. Many of us look forward to seeing it each year. Dotseed plantain has greater importance in the wilds than one might expect. Further North it is host to the larvae of two endangered sub-species of Checkerspot butterfly, the Bay checkerspot, Euphydryas editha bayensis and the Quino checkerspot, Euphydryas editha quino. Plantago species are eaten by larvae of the Common Buckeye butterfly, Junonia coenia, and Dotseed plantain is sometimes planted for this butterfly. 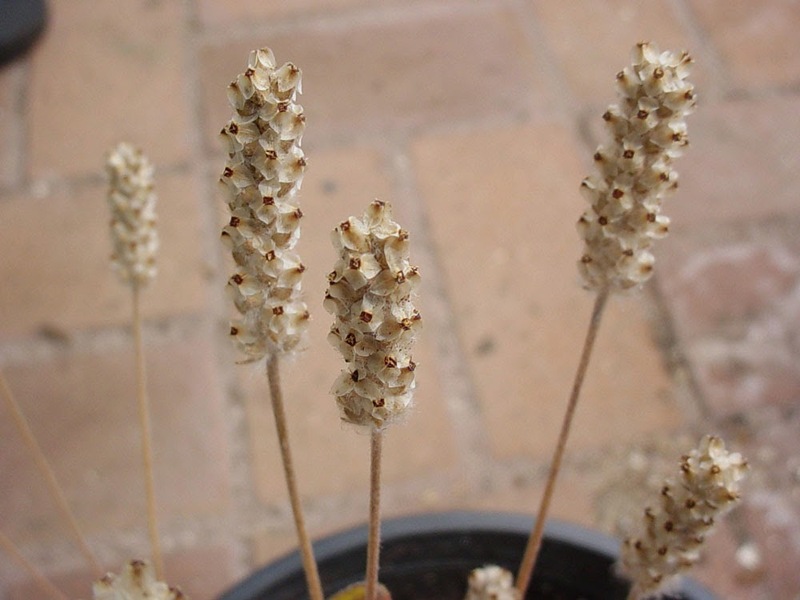 Seeds of Plantago erecta were formerly harvested in great quantities by Native Californians. It fact, it was considered an important grain plant. It's not clear whether this species was used in traditional medicine, as introduced plantains were in later years. But whether you eat the seeds or not, Dotseed plantain is a charming little plant; it deserves a place in more home gardens.